Our team keeps tracking news about media streaming, online video and audio from around the world. This gives a lot to think about the industry goes and about what we can do. As usually, we made a small digest of what we thought might be interesting for our customers and followers. The main event of this month was the NAB Show 2015 in Las Vegas. Our CEO Yury Udovichenko visited the trade show and met a lot of our customers and partners. You will see some of the results of these meetings in the near future. Take a look at a few pictures from the show in Facebook account (and subscribe to its updates if you haven't done it yet). One of the visited events was the DASH IF networking reception. Take a look at the inteviews of the participants. Also, check the best products of the show as seen by Streaming Media magazine. The Biggest Streaming Media Mergers and Acquisitions list for 2014 might be interesting to see what's going in terms of players' interests. A couple of acquisitions happend this month as well. Lynda.com e-learning platform joins LinkedIn. Akamai Acquires Octoshape in an All-Cash Transaction. “Amazon Web Services is a $5 billion business and still growing fast — in fact it’s accelerating,” says Jeff Bezos. Amazon's first quarter sales proove that. Jan Ozer intorduced a new article - New HEVC Patent Pool: What Are the Implications? The new technology brings new licensing terms. Also, check Jan's Producing and Distributing HEVC session from last year Streaming Media West conference to see where HEVC is now. Speaking of Jan, we should mention his digest on DRM Resources on the Streaming Learning Center website. JWPlayer presented The State of HTML5 video report update. bitmovin presented MPEG-DASH Device Compatibility report. bitmovin also gives an overview for Optimal segment length for adaptive streaming formats like MPEG-DASH & HLS. Those who like everything about drones, will be interested to read recent Dawn of the Drone: An Aerial Video and Photo Primer article. 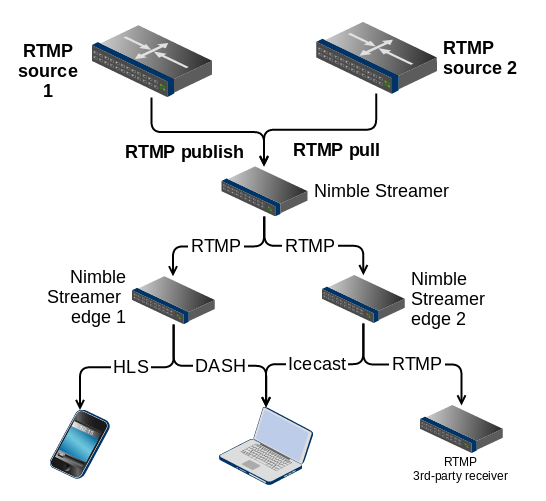 One of the first supported scenarios for Nimble Streamer was HTTP media re-streaming. Today this includes now HLS, SmoothStreaming, HDS and progressive download re-streaming. In this scenario Nimble is used as an efficient caching server which is able to handle media content properly. This means that re-streaming of live content will use its own set of caching techniques and VOD re-steaming will utilize cache in other way. Last year we released a wide MPEG-DASH feature set which included live streaming, video-on-demand and content protection. Having that, we later joined DASH Industry Forum to participate in its initiatives. As people discover more use cases for DASH usage, we wanted to provide full features coverage for this protocol. Like, companies consider using DASH for DRM so they need a way to efficiently deliver streams after the content is encrypted. So basically it's a good case for delivery of pre-packetized content to end users. 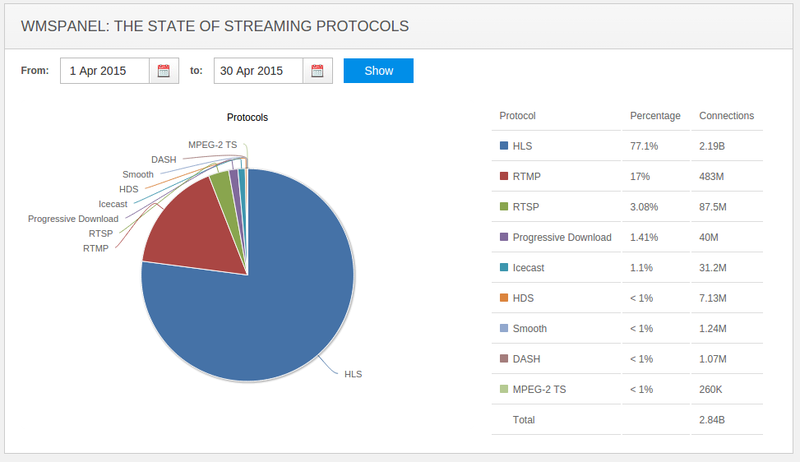 This is why we introduce the MPEG-DASH re-streaming capabilities in Nimble Streamer. Re-streaming cache works the same way as for other protocols. Live stream cache is stored for limited time while VOD media cache may be stored for large periods of time. what servers will handle this route. Streaming infrastructure maintenance requires some operations with hardware. The hardware may fail some time, it may be upgraded to improve the performance, or your system may need to be moved to other physical location. Being part of streaming infrastructure, Nimble Streamer server instance may need to down and then re-installed again. As it's a high-performance software, it may have a lot of streams' setting so losing the configuration in case of hardware changes is a bad option. To cover cases like hardware change we added a recovery mode for Nimble Streamer installer. It will re-register the instance in recovery mode and WMSPanel will push existing configs to it. WMSPanel provides rich API for obtaining various data from our products. This includes status API for Nimble Streamer which allows getting real-time information about each Nimble instance and make decisions like load balancing etc. So in addition to existing routes control API and Icecast control API, we introduce API for controlling RTMP streaming behavior. It can be found when you follow Nimble Streamer -> Live streams set up menu and then click on RTMP settings button for any of Nimble Streamer instances. Another functional area is ABR control for live streaming which is found on a separate ABR page for any Nimble instance. So in addition to existing routes control API we introduce API for controlling Icecast streaming behavior. It can be found when you follow Nimble Streamer -> Live streams set up menu and then click on Icecast settings button for any of Nimble Streamer instances. Stream aliasing is a well-known technique in media streaming. It allows mapping multiple names to single media stream in order to add some flexibility into streaming process. Nimble Streamer now supports it as well, with WMSPanel being an easy-to-use UI to set it up. It allows defining applications which will be covered by mapped applications' aliases. Basically, aliases are good for case when you have some media stream and you need to provide it under different names. As example, you are a content provider and want to give your stream to multiple partner websites and services. You need different levels of security for each alias. E.g. one of your partners need this stream to be locked to specific country and you need to use geo-location lock. And another partner needs to apply hotlinking protection. Adding separate aliases will allow creating separate security rules via WMSAuth paywall settings. You need to collect viewers' statistics per each of your partners. In this case after the aliases are set up, you create separate data slice for each partners' alias and give them their own logins in a branded panel. Each slice will have full set of stats for tracking audience performance. You need to stream your content from Nimble to CDN. So physically having 1 actual stream, you will give several "virtual" streams, without overhead of resources, but with all benefits of multiple streams. Let's see how it is set up. WMSPanel cloud service is known for its reporting feature set available for various types of media servers such as Wowza, Nimble Streamer, Flussonic and more. WMSPanel provides rich API for obtaining various data from our products. So now we introduce API methods for obtaining geo-location and ISP statistics available in our reporting framework. To use this feature set, run the designated methods from listed below. Full list can be found in WMSPanel products API reference. Enable API access - this is where you need to start from. Get data slices list - get IDs of the slices for further requests. Get Geo stats - get geo-location statistics for selected dates range. Get ISP stats - get Internet service providers statistics for selected dates range. Each method is illustrated sample request URL which you may use via any technique or programming language. If you run it from command line, check this FAQ question as well. Follow us to learn about new features and contact us in case of any questions. From the time of its wide adoption, RTMP played an important role in media streaming. Along with Flash player, it opened online video capabilities for huge audience of developers and consumers. This protocol is still the best option when it comes to real-time streaming as it has the least latency among other technologies. It is also used as a fallback for HLS, HDS, SmoothStreaming or DASH when it comes to platforms which do not support these protocols. Thus people keep using this protocol and we need to provide best user experience in streaming. Notice that RTMP playback scenarios will be declined by the industry during 2019 and 2020 due to Flash technology support discontinuity. So if you need real-time latency for live streams, take a look at Get ready for Flash farewell and RTMP decline article explaining to handle this shift. Nimble Streamer team has added RTMP streaming support for playback and pull for scenarios when Nimble has RTMP stream as an input. Both published and pulled RTMP sources are supported.